Fashion , Art and Human Statements : Putin:A brilliant strategist,a cunning tactician or mad? 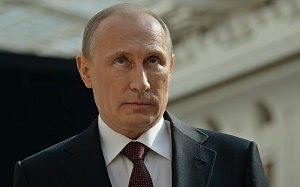 Putin:A brilliant strategist,a cunning tactician or mad? At a recent conference held in the Baltic states, one word dominated the agenda: Putin. They could have discussed Russia and its foreign policy more generally, but all routes lead to a president whose 15 years in power have left him in total charge. Amid increased fears of all-out war in Ukraine, governments and policy makers around Europe are anxiously analysing the motivation of the most dangerous politician on the continent since the end of the Cold War. In stark terms, three possibilities are considered: is he a brilliant strategist succeeding in a long-term plan to create a 21st century variant of the Soviet Union? Is he a cunning tactician who responds to events as they happen? Or is he mad? No consensus was reached at that conference because the complexities of the human brain defy such simple assessment. Indeed, all three explanations could be said to be playing a part – to devastatε effect. A decade ago, Putin described the demise of the USSR as the greatest geo-strategic catastrophe of the 20th century. He is infused with the standard KGB mind-set of paranoia, vindictiveness and self-confidence. After seeking to engage the West in the early 2000s, attempting to be amenable on issues ranging from Iraq to Afghanistan (and, to a degree, justifiably feeling let down), he reverted to type, setting himself in contradistinction to Western enlightenment values. Soviet-era contempt for human rights and free speech were reinforced by a revived position for the ultra-conservative Orthodox Church. When the people of Georgia and Ukraine (twice) sought a different path, he dismissed the popular movements as orchestrated by the CIA and NATO. The overthrow of Ukraine’s corrupt pro-Moscow ruler, Viktor Yanukovych, gave him a new opportunity. He merged the immediate task of preventing the encroachment of democratic values onto his doorstep with his previously vague dream of a greater Russia. The seizure of Crimea was brazen, but straightforward. Many governments in the West were quietly reconciled, given that it had been Russia’s until the 1950s. The insurgency in eastern Ukraine was different. Even the most credulous dove struggled, after a while, to believe that the self-proclaimed Donetsk People’s Republic was anything but coordinating with and heavily armed by the Kremlin. Now Putin does not even bother to pretend. The predicament, for all sides, is now alarming. Putin’s cult of personality among “ordinary” Russians – many of the more urbanised middle-class have either quit the country or are keeping their heads down – revolves around the image of the bare-chested tough man fighting the good fight. The more Russia’s economy contracts, the more its dependency on oil and gas exports is exposed, the more he knows he has only his machismo to fall back on. Compromise on Ukraine could easily be interpreted as retreat. In any case, nothing unites a populace (particularly one that is now deprived of news that is anything other than propaganda) more than a war against an outside enemy. Boxed into a corner, he is playing a weak hand reasonably adeptly. His immediate aim is to drive a wedge among Western governments who have struggled even to agree on sanctions. If they provide weaponry to the Ukrainian government (as John Kerry, the US Secretary of State is proposing), they may redress the military balance in the short term. But, unless they really want to commit NATO to all-out war, Russia knows that if it wants to step up the pace, it can. The next few weeks will be crucial. It was right for Angela Merkel and Francois Hollande, the German and French leaders, to go to Moscow. So far they carried off their task well, displaying an openness to listen rather than a willingness to buckle. Britain’s marginal role is a reflection of the new reality of European politics. Merkel is fighting against a German political establishment that has long sought to accommodate Russia. Hollande’s predicament is similar. Putin saw how easy it was during the 2003 Iraq war for George Bush to mischaracterise Europe into “new” and “old”. But the core of that division remains, with Poland and most of Eastern Europe fearful of Russia and determined to be tough with Moscow, while others are keen to cut deals. The EU’s new high representative for foreign affairs, the Italian Federica Mogherini, has a track record of being soft on Russia. Britain has lurched from weakness (the initial attempts to prevent a full inquiry into the polonium poisoning of Alexander Litvinenko being the most abject example of appeasement) into a stronger position. Putin will have to be convinced that it is not in his long-term interests to play with fire in Ukraine. The most effective counter-measures against Putin remain economic. So far the sanctions have been little more than pinpricks. Russian money laundering and thuggery are intertwined. Putin and his cronies are at the heart of the action. Western governments and banks know where he is vulnerable. But are they willing to take the financial hit to strike back at him?